The last Biafra heroes' day of Monday 30th May, 2016 at Onitsha remains indelible in the hearts of the Indigenous People of Biafra. The residents of Nkpor Agu town and the adjourning communities have not fully recovered from the shock it sent down their spines. It was, perhaps the darkest ever experienced in the Biafran struggle since the illegal abduction and incarceration of Mazi Nnamdi Kanu, the Biafran leader . Prior to that fateful day, multitude of Biafrans converged at the venue for the memorial. At midnight, on the very eve of the D-day, soldiers from the 33 battalion Onitsha invaded the famous St. Edmund's Catholic church where thousands of Biafrans had assembled to keep vigil. They forcefully broke into the church, spraying cannisters into the auditorium and shooting sporadically on the unarmed Biafrans. So many people died as a result of that while several others were permanently injured. As if that was not enough, the shooting continued again in the morning. 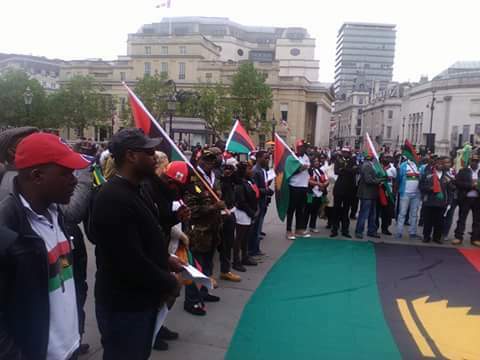 Biafrans regrouped to match in honour of our fallen heroes. More truckloads of soldiers stormed the town, spraying live ammunitions everywhere, at the same time made away with the dead bodies of Biafran youths to a nearby barrack. Men and women were arrested and taken to unknown destinations including the residents of the town. Cans of acid were poured on would-have-been survivors who ended up dying as a result. This could be to cover up the identity of the victims. There were also those buried alive for the same purpose of identity cover up. It was a horrific and unforgettable experience. The unwarranted kidnap, torture and incarceration of Mazi Nnamdi Kanu on the 14th October, 2015 sparked peaceful protest worldwide. Biafrans gathered, praying for his unconditional release at Ngwa High School. They were rounded up by the 144 battalion, Asa and massacred in cold blood to the amazement of the whole world. Those abducted alive were later found dead dumped in shallow graves near the barracks with their bodies decimated with acidic substances. In Asaba, Yenagoa, Enugu, Igweocha, Awka and Calabar the casualties were unimaginable. Again, Biafra land flowed with the blood of innocent helpless Biafrans killed by the Nigerian soldiers at the command of Muhammadu Buhari on the 20th January, 2017. The people came out in a rally to celebrate with the United States during the inauguration of Donald Trump, the President of America. They were brutally killed, more than 20 corpses slain by the soldiers from 6DIV Port Harcourt Barracks littered the ever busy Aba road, while over 65 persons were arrested and detained in wield cells. These are few of the many reasons why we mourn. It is understandable that our kiths and kin have been gruesomely massacred in Nigeria for nothing other than asking for freedom. Freedom has become a crime in a lawless country like Nigeria such that if one mentions it, he is killed within a twinkle of an eye. In spite of all these, we are still resolute and formidable in our quest to restore Biafra. Mazi Nnamdi Kanu, the leader of the Indigenous People of Biafra and the arrow head of the Biafran struggle has eventually united our clans and people, emancipated our generation from mental slavery, exposed our historical background and laid bare all the atrocities melted out on us all these years. We struck our chests and without any equivocation chose freedom and self determination. The brilliant successes already recorded in our quest to restore Biafra, regain our lost identity, is resounding all over the universe. These significant victories guaranteed IPOB as a legitimate group, people with same core value system. The independence and freedom of the Biafran people cannot be over emphasized. It is indelibly written in the conscience of humanity, sustained by the labour, sweat and blood of our gallant heroes and heroines. They proved fearless before our enemies, surrendered their lives and made tremendous sacrifices for us. Hence, the struggle continues and every year we meditate on the remarkable sacrifices made by our fallen heroes. We show in sober reflection that their blood shall never be shed in vain. We make reference to the genocide committed against our people between 1967-1970, in which over 3.6 million Biafran men, women and children were horrendously killed, mostly through starvation. The joy of it is that IPOB under Nnamdi Kanu has sounded and awaken the spirit of Biafra that our forefathers nurtured through selfless sacrifices. So, on this occasion of BIAFRA HEROES' DAY, we mourn and cogitate on the sacrifices made by our fallen compatriots. All the Indigenous People of Biafra at home and diaspora need to be optimistic on the outcome of our struggle. The fight has just begun, it may seem uneasy but at the end we win.